These cookies take longer to make than the average sugar cookie recipe, but I just accept the fact that sometimes it takes longer to make good things. I leave about 2 hours from start to finish to make these cookies. And, of course there are so many ways you can decorate them – frost, dip in chocolate, or just eat plain! After they’re baked, you can add the cookies to a dehydrator (or oven at about 170 degrees F) for about an hour to put some crunch into them (or back into them). Cream the butter and honey together in a mixer. Add the egg, salt, nutmeg, and baking soda to the butter/honey mixture and blend well. Blend in the almond flour and roll into 4 small dough balls. Flatten each ball of dough, wrap it (in plastic), and place in the freezer for at least 30 minutes, or up to an hour. Place each flat ball of dough between two sheets of parchment paper or other non-stick surface (plastic wrap works too), and roll out to about 1/4 inch thickness (or 1/2 cm). Sprinkle some almond flour on the bottom and top of the dough before rolling to prevent sticking. Using cookie cutters, cut out the cookies and gently peel them off the parchment paper onto a baking sheet. An alternative is to peel the dough around the cut-out shapes and then transfer the parchment paper (with cookies) onto a baking sheet. Bake the cookies for about 8 minutes, or until the start to brown along the edges. Cool the cookies. At this point they may have enough crunch, but if you want more crunch, let them cool, turn them over, and bake them for about an hour in an oven at 170 degrees F.
I may have to get some cookie cutters just to try this. I’ve been loving almond flour lately (just made a pumpkin pie with your crust recipe–divine!). They look delicious! I am going to have to try this. I have been using almond flour but have not made cut-out cookies yet with it. I am sure that it will be just as delicious as the other recipes that I have tried so far from your site! Is this a new layout? It looks great :-). I’ve never really liked cookies so I think I’m saving my kitchen energy for something else, but this post put me right in the christmas mood anyhow, thanks! Do you think Olive oil would work instead of butter? We are dairy free, but also found out we can’t have coconut or palm (among MANY other things). And we’d also be using an egg replacer. Thanks for the recipes you share! Kristy – I don’t know about the pumpkin or sunflower seed meal, or the oil – my guess is the oil will make them spread a bit more than you would like (not keep their shape as well). What about vegetable shortening? Your gf cookies look wonderful!! I have more then 120 cookie cutters so I must make this tasty & easy recipe!! Yeah! These look good! I have never had successful cut out cookies, but I’m going to try again. These do look great. Do you only have to bake them at 325 for eight minutes? Or do you also have to bake them at 170 for an hour? I want to make sugar cookies with my daughter this year and it would be great to bake some that I could eat with her! Amy – you definitely need to bake at 325 for 8 minutes. For more crunch, leave it in the oven at 170 for an hour. This recipe looks great, so glad i could remind you about this and help put people in their holiday spirit, i definitely have some winter & holiday cookie cutters, so i can’t wait to try this. Yummm! hurrah! i have a cupboard full of cookie cutters that i was resigned would live out their lives with minimal use. now i can make up a batch of cookies to frost with my almond-loving kitchen-helping toddler! They sound great! In Sweden we do gingerbread cookies every christmas that look similar to these. It’s really tasty with lots of spices. I’d love to make them with almond flour, inspired from this recipe. I’ll let you know how they turn out. David, yes – these turn into gingerbread cookies when you add a few more spices. I’d love to hear how yours turn out. I may post a version of gingerbread cookies as well. These look wonderful. Could you use agave nectar instead of the honey? If so, would the amount be different? Yes, I feel pretty confident you can use agave. I haven’t done it, but it’s a 1:1 substitution. Thanks so much! I can’t wait to try these. I think baking and then frosting them will put me in the holiday mood. I will let you know how they turn out with the agave nectar. Any suggestions on how to replace honey. Does the honey help hold the cookie together so it doesn’t crumble? Do we need extra liquid when using stevia? Thanks so much for all you’re doing!!!! i was just talking to someone about how much i wanted sugar cookies!now for a gingerbread house! We just made these in time for Hanukkah and they turned out great, the dough fell apart a little bit but it worked out okay 🙂 we did 1/3 sprouted whole wheat flour, 1/3 rice flour, and 1/3 of it almond flour. We used the icing recipe from your whoopie pies and put them in a little plastic bag with a slit at the end so that we could decorate them like we used to. Great cookies and Recipes! Looks delicious, when i can have yeast again i’ll have to try those, but maybe i will get some of those tortillas. For now i get bread from http://samisbakery.com/ Delicious, and i recomend to anybody! Can you substitute splenda or sucralose for the honey?? Sorry Meghan, I just don’t know for sure with this because I don’t use them. I do know folks use splenda + glycerin to sub for honey. I made these today and liked the dough so I added arrowroot powder to make a dough of the same consistency as dough for a cookie press. It worked nicely and the kids really liked them. Thanks for the recipe…love it with nutmeg! Thanks for the addition info! The cookies were great but the dough was very sticky and hard to cut-out with cookie cutters. If the dough is sticky, try adding a bit more flour to it. And freeze it for a bit more. Hey, question. Are these cookies crispy or chewy? Do you think I could use coconut flour instead of almond flour? No, sorry to say. 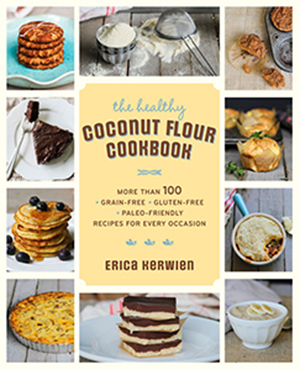 Coconut flour behaves totally differently than almond flour. Thank you so much for this recipe. 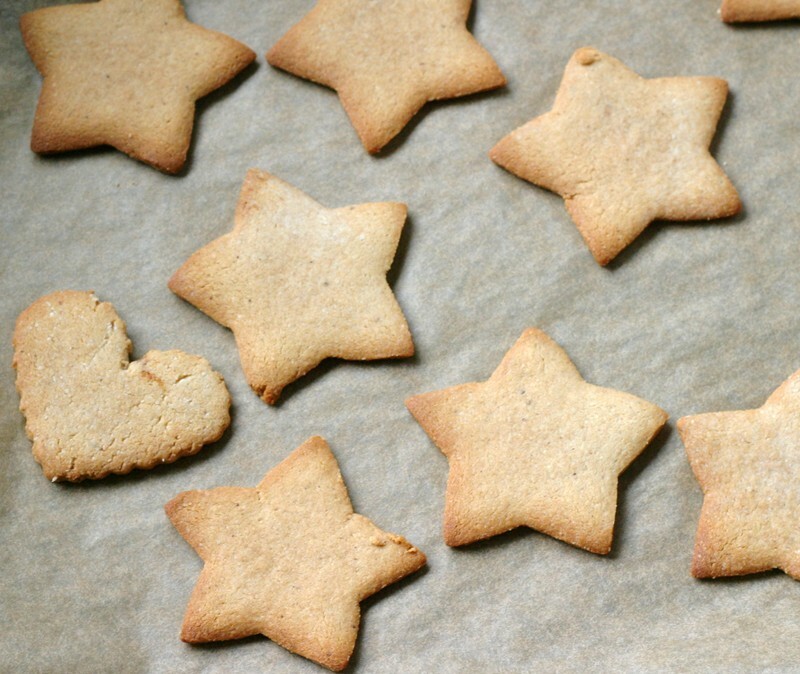 My 4 and 2 year old children loved the batch of heart cookies we made using this recipe. I used Ghee as my oil and it gave such a lovely smell to the kitchen as it melded with the almonds and honey. I did crisp them in the oven as suggested, and I appreciate that suggestion, or else I think my children would not have liked them as they are too mushy otherwise. But if you are doing GAPS diet, or Nourishing traditions, this recipe really feels true to home because you already know about crisping nuts in your “warm oven,” and in the same spirit you are crisping these cookies up and dehydrating them. I was so happy to see my children gooble all these up. And it is great that they in fact do make 40 cookies! So good to hear! And Ghee is great! It’s actually the only source of butter that is alkaline, so I’ve become very interested in it. Thank you for the recipe. I’ve followed the recipe exactly and so far baked just 1 cookie and it spread way too much. I’ve tried making cookies with almond flour before and had the same problem. I could already tell before I froze the batter that it had too much liquid. Not sure how to salvage the batter. It may be too late to add the arrowroot as one person suggested. I’ll probably try adding more almond flour. I ended up adding a lot more almond flour, maybe almost a cup. Then the cookies weren’t very sweet so I dipped them in chocolate. The cookies are still quite delicate but I will try the recipe again. Thanks for the recipe! Can I use Bob’s Red Mill Almond Meal/Flour? Will the flour be fine enough? Yes – I just made this recipe with Bob’s Red Mill Almond Meal/Flour, and they were great! They did have a certain gritty texture which gave them a nice depth, and the density/moisture were good. I did bake them the extra hour, and they held together even with some icing, and were still soft. Do you have a paleo-friendly icing recipe for these? Not sure it’s possible but definitely trying to find something sweetened with something other than powdered sugar that still sets up well on the cookies. Thanks! try searching on frosting. also, the lemon glaze that I recently posted with the scones might be nice. So glad I stumbled upon your site. I went grain free about 6 months ago and have been thinking I need to find a cut out cookie recipe because Christmas baking is one tradition I didn’t want to give up. I am allergic to almonds. What substitute might work best? You can use cashew flour. Are you also nut-free? Hi Erica, in the recipe for cut out cookies with almond flour it shows 1 tsp nutmeg or cinnamon but the directions do not state when to add it to the batter. Where do we add it? can I use 1/2 almond flour, 1/2 coconut flour? The recipe would change significantly by adding almond flour so other ingredients would have to be adjusted.